Rob Fletcher speaks to Fisher Print about their new Agfa Anapurna wide-format hybrid printer and how it enables them to look for new work in profitable markets. UK print service provider (PSP) Fisher Print has paid tribute to its purchase of a new Agfa Anapurna wide-format hybrid printer, explaining that the machine will allow the company to go in search of new work in profitable markets. The Anapurna H2500i LED has the ability to print on media as wide as 3.2m, thus allowing Fisher Print to expand its service offering into other markets within the wide-format print and sign-making sectors. The device boasts a top speed of 115sq m/hr in draft mode, while users are also able to opt for various other modes depending on the type of work that they are producing. These include express mode with a top speed of between 70 and 78sq m/hr; production mode at speeds ranging from 35 to 57 sq m/hr; standard quality mode at between 21 and 31sq m/hr; and high-quality mode with speeds of 16 or 17 sq m/hr. 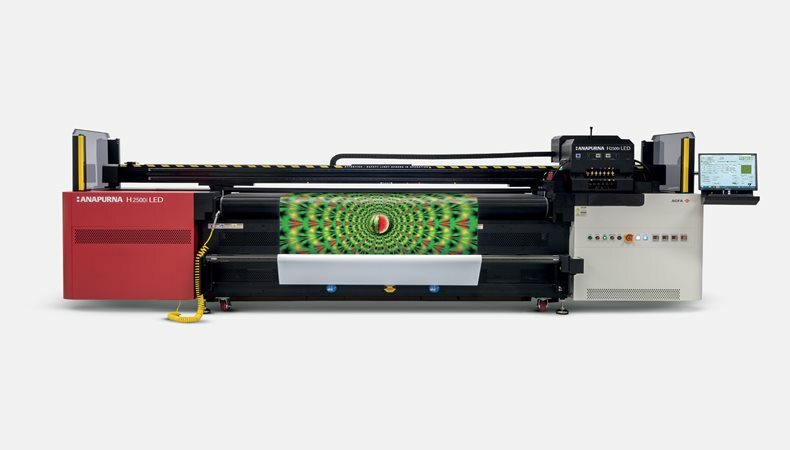 “Our new wide-format hybrid Agfa Anapurna printer combines high quality with high productivity for outdoor, indoor, rigid and flexible wide-format jobs,” Fisher Print said in a blog post. Fisher Print has been in business for more than 70 years and is already active in a range of print and sign-making markets. However, as the company explains, its new Anapurna H2500i LED will allow it to become even more flexible in terms of its service offering for customers. “Incorporating the latest technology in the Anapurna H2500i LED, it is ideal for printing banners, posters, exhibition graphics, POP, mock-ups, backlit, frontlit and self-adhesives such as labels. “We can also look at more niche applications including DVD printing, wood, art reproductions, personalised object printing, as well as party gadgets like beer coasters. Expanding on the features of the machine, Agfa cites environmental and cost-saving benefits as key selling points for the device. Agfa said: “The wide-format hybrid Anapurna LED series is a perfect fit for sign shops, digital printers, photo labs and mid-size graphic screen printers that want to combine board and roll-to-roll print jobs.